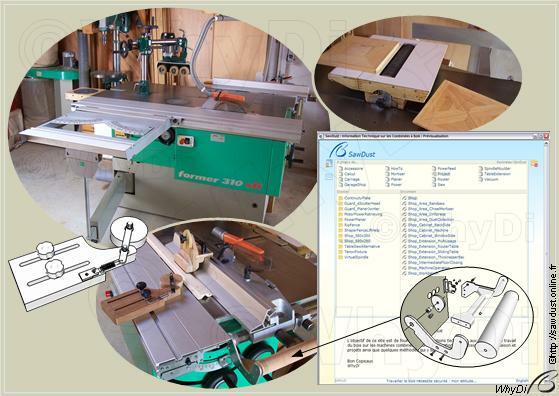 The purpose of this site is to present technical information to enthusiastic woodworkers about combination machines and their home made improvements, accessories and projects as well as woodworking related techniques. Clicking the folder icon on the top corner enables you to quickly navigate and search amongst the numerous documents as you may do on your own computer. A good place to start may also also be the frame and panel document or else the drawer making albeit the provided internal links might guide you deeply into the jigs and machine improvements. Take care to not get lost ! You would rather go for a shop tour or search into the cabinets ? The machines and their modifications and shop-made accessories. The L shaped worktop and retractable table. The hand tool rack within arm reach from the bench. The bench cabinet and clamp shelf. The power tool cabinet and small hardware organizer.